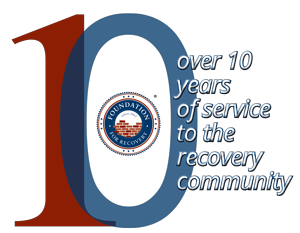 Foundation for Recovery believes that recovery from addiction can be as far-reaching as the illness itself. With The Rooms, we hope to provide a safe haven not only for the individual but also for loved ones and friends who may themselves be involved in recovery. The Rooms provides safe, comfortable meeting space to the local recovery community. This facility provides affordable space for 12-step fellowships, other support groups community activity groups for meetings and events. For the convenience of our attendees, coffee, snacks and refreshments are available twenty-four hours a day through vending machines in the common area. In addition, seating, tables and individual lockers are available for all groups. Please review the rules and regulations before reserving space at The Rooms. We have rules and regulations to ensure we have a clean, damage-free, safe, and secure space. Each group is then autonomous and free to create a comfortable atmosphere of recovery. Possession, use, or sale of alcohol, illegal drugs, weapons, or contraband. Smoking is prohibited inside The Rooms facility. Smoking outside the facility is allowed with the proper disposal of cigarette butts. Individuals or groups discarding of trash other than in designated trash receptacles. Groups must clean up after every scheduled meeting. Bringing animals onto the premises, with the exception of service animals in the company of, and trained to assist, individuals with disabilities. Physically or verbally threatening or harassing any person and/or committing acts that endanger individuals or groups. Defacing, damaging, or destroying property of The Rooms, meeting participants, or visitors. Assembling for a purpose other than the facility’s intended use. Occupying any room over the posted maximum capacity. Soliciting for any purpose, including asking for money, contributions, or donations unless such activity has been approved by the Board of Directors. General storage or use of bicycles, skateboards, roller blades, or any other form of transportation within the facility without prior authorization from The Rooms. Use of camera equipment in the common area of the facility. Use of camera equipment in each room is allowed only with prior approval. Loitering, congregating, or obstructing any of the surrounding business entrances. Explicit and/or obscene language or gestures toward a person”™s ethnicity, religion, or sexuality. Sleeping inside or outside the facility of The Rooms and/or any of the neighboring businesses. Becky Willard at (702) 257-8199. Consisting of four rooms that vary in size, The Rooms are available to rent 7 days a week, 24 hours a day. One room holds 75 people, one room holds 35 people, one room holds 25 people and one room holds 12 people. All rooms are professionally cleaned three times per week. The facility – including all rooms, restrooms and common areas – is handicap accessible. There is an elevator in the main lobby. Snacks and refreshments are available twenty-four hours per day through vending machines in the common area. Rates are very reasonable and vary depending on the specific room, day and time slot. For more information on renting space at The Rooms, call Becky Willard (702) 257-8199.